Choose a form will from the Internet, a stationary shop or your local law library. Ask the librarian to help you determine whether your state has a statutory will, which is a form will set out in the probate statues. California does as do several other states. If not, ask for a form will prepared by the local Bar Association. Read through the form will and consider whether it is appropriate for you. While form wills work well for simple or straight-forward estates, estates with complicated investments and myriad heirs may need a lawyer. Insert your identifying information in the opening paragraphs. This language affirms that you are of legal age and sound mind to make a will. If you are under 18, check your state laws to be sure you are not underage. Sound mind means that you are rational; courts assume an adult is of sound mind absent strong evidence to the contrary. Consider your bequests. If you leave your estate to one person or several people in equal parts, insert their names in the devise section. If you want to leave specific items of property to specific heirs, describe both the property and the heirs carefully to avoid confusion. Use numbers when possible to identify property, such as bank account numbers, vehicle license numbers and real estate parcel numbers. If you condition any bequest, name an alternative beneficiary in case the condition is not met. One popular condition is that the heir survives you. Name a residuary beneficiary to inherit whatever you neglected to devise specifically. Select a guardian for your minor children. If your spouse survives you, your spouse will assume care of the children in most situations. However, name a guardian in case your spouse does not survive you. Consider appointing a separate financial guardian to manage your children's money until they come of age; banks often assume this role. Name an executor to administer your estate and handle probate. Check with the persons you select before you execute your will to be sure they accept the appointments. Sign your will. This is termed "executing" your will and is regulated by statute to ensure that the document is what it purports to be. All states require that you sign a will before at least two witnesses. Select adults who are not heirs under the testament. 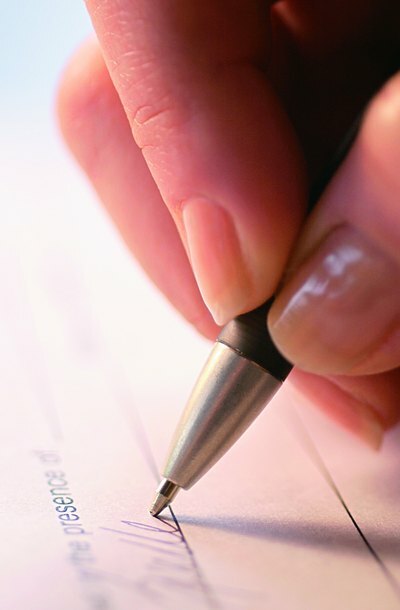 Affirm to the witnesses that the document is your will, then sign it while they are present and watching. Each witness signs in the appropriate blank at the end of the will. You are not required to show witnesses the will or discuss its contents with them. Entrust your will to your attorney or your executor. Alternatively, store it in your safety deposit box or home safe. Some states allow testators to file sealed wills with the court; they remain private documents until the testator dies.